Up until that conceptual barrier was broken through, something kept popping up which indicated misalignment. This was causing me alarm, distress and lost time. I knew at some level something was not quite right but I could not get a better handle on it. That was until a few days ago when I had the unexpected realization that a Wellness as a Service (WaaS) industry is emerging. Copyright (C) United Feature Syndicate, Inc.
Just as today consumers and businesses pay for Software as a Service (SaaS), you will see a similar trajectory and emergence of subscriptions to “wellness services”, including mobile apps and a burgeoning market in the sale of consumer “wellness devices” (predominantly in the form of wearables) coupled to these services. You will see an expansion of consumer focused postal and retail delivered body data (blood, DNA, saliva, microbiome) gathering services for the purposes of disease prevention and health/wellness optimization (typically coupled with a mobile/wearable app). You will see business model innovation including application and device subsidization by corporate wellness programs and health insurance plans. You will see a highly diverse range of players converge, collide and partner as the WaaS industry ecosystem breaks-out and rapidly evolves. From mobile manufacturers (e.g. Apple), fitness wearables (e.g. FitBit), connected sports apparel companies (e.g. Under Armour), sleep technology (e.g. Rythm), mobile disease prevention and health optimization apps (e.g. Dacadoo/Quealth), stress reduction wearables (e.g. Spire), consumer electronics (e.g. Bose), family blood tracking and insights at home (e.g. Cor), family body-chemistry tracking and insights at home (e.g. sano), whole human genome sequencing with companion app for longevity and health optimization (e.g. Veritas Genetics), smart clothing with cloud intelligence for longevity, health and fitness optimization (e.g. Hexoskin), A.I. driven nutrition guidance (e.g. Suggestic), meals-on-demand (e.g. sprig), to corporate wellness programs and insurance (e.g. Welltok), computational systems biology in the cloud (e.g. LifeQ), consumer disease prevention and wellness optimization lab services (e.g. Arivale), all the way down to the IC biosensing componentry level (e.g. Analog Devices). Prior to this conceptual realization I was trapped in an endless game of whack-a-mole. Although the speaker and content pipeline was both full and great, ticket registrations were reasonable, anomalies kept surfacing. For example I kept receiving and had to subsequently reject talk proposals because I deemed that they belonged to “digital health”, “preventive medicine”, “health 2.0” or “quantified self” instead. 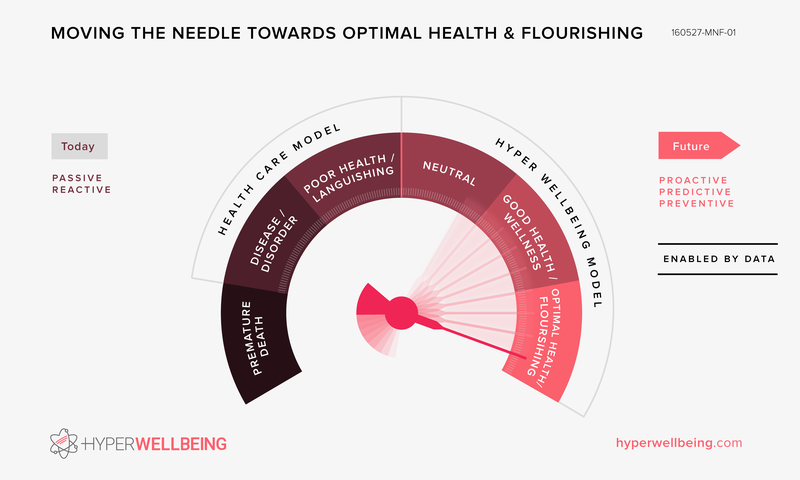 All of which are related to the hyper wellbeing vision and I hope to partner with influencers in each of these worthwhile domains, but nonetheless they are adjacent. It was gruelling to keep individually explaining why a company or a talk was not appropriate for this inaugural event. The whack-a-mole symptom recently hit a crescendo. I had to turn down a drug compliance connected-device company who approached and offered much needed sponsorship support. I had to suggest that they approach the Health 2.0 event organizers instead. Around the same time I noticed that ticket registration traction is not just coming from those expected (those concerned with the future of mobile and wearables) but from areas I had not anticipated and had not conceptually included (healthcare, preventive medicine, population health, health insurance, corporate wellness, health management consulting etc). This is why I had the summit tagline changed yesterday to “Wellness as a Service (WaaS) Summit” from the existing “Mobile, Wearables & Wellbeing Convergence Summit”. Yes mobile and wearables are converging and yes both are converging on the human, opening up the potential to leverage the sensing/augmentation/data to prevent sickness and amplify wellbeing. However that was two-thirds of the picture, leaving out a critical third; for example a pioneering company such as Arivale who are not mobile/wearable focused. Essentially I’d been too focused on the technological how rather than the industry macro-level perspective of what.